Obverse description: Bust left, with four swags of drapery at breast interrupting legend, clasped by a circular brooch at the shoulder; in front, vertical sceptre. 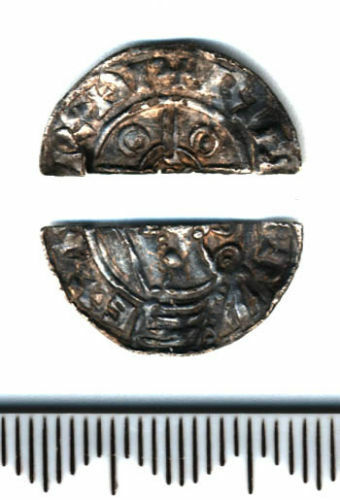 Reverse description: Short voided cross, two circles around the junction of the arms; annulet enclosing a pellet in each quarter. In inscription, the D is crossed to make an eth (TH). A pierced 7th-century early medieval pale gold sceat, Pada type (Pa III), c. 660-675.